TORONTO, May 31, 2018 /CNW/ - Anaconda Mining Inc. ("Anaconda" or the "Company") (TSX: ANX; OTCQX: ANXGF) is pleased to announce assay results from four drill holes (1,043 metres), as part of 9,753 metres of diamond drilling completed since October 2017 (the "Drill Program") at the Company's Goldboro Gold Project in Nova Scotia ("Goldboro"). Two drill holes (BR-18-26 and -27) targeted cross section 9350E and two holes (BR-18-28 and -29) targeted cross section 9550E located in the eastern portion of the Goldboro Deposit within the East Goldbrook Gold System ("EG Gold System") (Exhibit A, B and C). 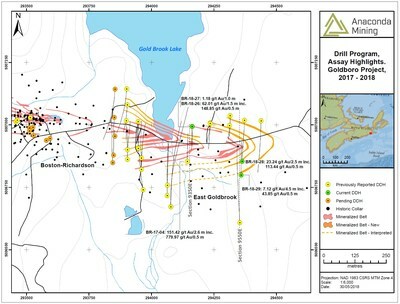 Drilling within both section 9350E and 9550E are part of an infill and expansion drill program designed to better define specific areas of the EG Gold System as part of the work outlined within the Goldboro Preliminary Economic Analysis filed on SEDAR on March 2, 2018. The Drill Program testing sections 9350E and 9550E has successfully extended known mineralization identified by historical drilling and new zones identified by Anaconda's recent drilling. Within section 9350E (Exhibit B) holes BR-18-26 and -27 successfully extended three mineralized zones of the EG Gold System on the northern limb of the fold structure by 150 metres. Within section 9550E (Exhibit C), holes BR-18-28 and -29 extended three recently discovered mineralized zones of the EG Gold System down the southern limb by 200 metres and confirmed the down plunge extension of these mineralized zones. Holes BR-18-28 and -29 also confirmed the extension of the two deepest mineralized zones of the EG Gold System down plunge. Thirteen separate occurrences of visible gold were observed in the four reported drill holes. 151.42 g/t gold over 2.6 metres (33.1 to 35.7 metres) in hole BR-17-04 (previously reported). 6.68 g/t gold over 3.0 metres (197.5 to 200.5 metres) in hole BR-08-24. 8.57 g/t gold over 1.0 metres (344.5 to 345.5 metres) in hole BR-87-09. "The Drill Program continues to yield consistent, strong results in terms of grade and width. As with other sections drilled in the Goldboro Deposit, we have extended sections 9350E and 9550E down dip and down plunge. We're building off robust historical drill results and seeing that there is continuity across sections, both down and up plunge. The overall predictability of the deposit is increasing our confidence that we can efficiently grow the mineral resource. 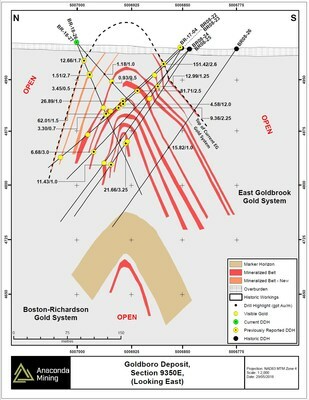 Future drilling within sections 9350E and 9550E will focus on going deeper to reach the prolific Boston-Richardson Gold System and demonstrating that Boston-Richardson continues down plunge beneath the EG Gold System." Anaconda is currently drilling an additional 2,000 metres to follow up on the success of the Drill Program to date. The primary purpose of the additional meterage is to drill adjacent to Section 9100E from which the BR Gold System contained broad zones of high-grade mineralization associated with displacement of the existing deposit along a fault system. The Company is testing the hypothesis that it has encountered a new, fault related setting for gold mineralization within the Goldboro Deposit as has been observed in similar deposits within the Victorian Gold Fields of Australia. Anaconda is also allocating approximately 500 metres to infill certain areas of the Mineral Resource that form part of the Company's planned underground bulk sample, which is expected to occur later in 2018. Reported mineralized intervals are measured from core lengths. Intervals are estimated to be approximately 75-100% of true widths of the mineralized zones. In section 9350E holes BR-17-04, BR-88-22 and -23 encounter the northern limb of the fold at approximately 75 meters, where the true width of the mineralized zones may be less than 50%.